No matter how much I am in denial, the reality is there. Next Wednesday night is the first Passover Seder. Over the last month or so we have been slowly gathering more healthy recipes to use for Passover. Of course also with that we have been going into debt buying Passover items before the stores run out. This year JL and I promised each other that we would not buy as much of the prepackaged Passover foods, mixes and things. We have our own baking pans for Passover and bought ingredients that can be used to bake the boys some goodies. Of course we did buy some Rainbow and Bon Bon cookies because those are quite difficult to replicate. 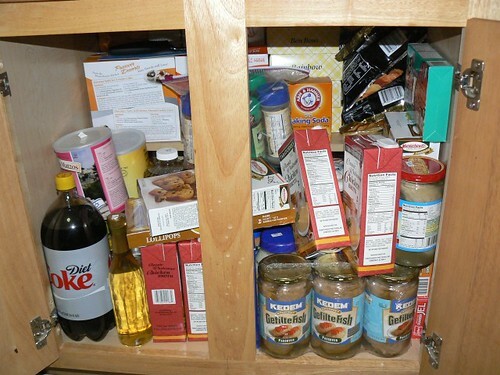 Here is the cabinet in our kitchen completely filled with all of our non-perishable Passover food/baking/spice items. My biggest dilemma with Passover is breakfast. Most morning I eat instant oatmeal. It is filling, low points and keeps me energized for the morning. Sadly there is no really good option with this for Passover. The boys will likely be eating a LOT of matzah and cream cheese. Yummy indeed, but it is not really an option while being good. I seriously do not want to undo the weight loss that I have done, especially given the commitment to work outs that I have been doing. Since Sunday, I have already done 16.5 miles of work out with Leslie Sansone (not including today). According to JL, it can be used as a hot breakfast cereal of sorts. Has anyone tried this and have any suggestions? Trying to come up with some more options for Passover. We have yogurt, although not one that I really like since it is Kosher for Passover. There will also be egg whites, which are great if I have time to cook them. And of couse I could also do cottage cheese and fruit. If you have any other suggestions for healthy Passover meals, especially breakfast and even lunch, I would love to hear them. There are a lot of past postings where I talk about Passover. Just do a keyword search for Passover. Here are my posts from the Seders last year: Happy Passover 2008 – Seder 1 and Seder Part Deux – 2008. 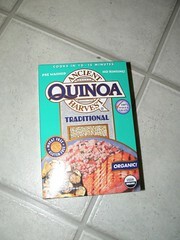 When I had quinoa it did NOT taste like anything i’d want for breakfast or a sweet dish. It’s pretty much like couscous but bigger grains. Sorry! how different could it taste from steel-cut oats? also – there’s egg substitute instead of egg whites, easier to just pour into the pan and cook.